EAGLE Academy Inclusive Post-secondary Education Program is a two-year certificate program of study which teaches independent living and career skills and empowers students to achieve Equal Access to Gainful Learning and Employment (EAGLE). EAGLE Academy is currently years three and four of a four year program. EAGLE Academy helps young adults with intellectual and developmental disabilities make a successful transition from high school to adult life by providing them with an inclusive college experience. This experience will provide development of their academic, vocational, daily living, and decision making skills. Upon successful completion of the program, students receive a certificate of completion. EAGLE Academy is a certified comprehensive transition program (CTP) for highly motivated young adults whose disability is characterized by limitations in both intellectual functioning and adaptive behavior. 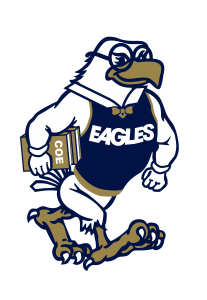 EAGLE Academy students typically received special education services while in high school, graduating with either a regular diploma or a special diploma. As a CTP, our students can apply for federal financial aid. Please click the photo below to view an informational video describing a current inclusive post-secondary education program at Vanderbilt University. We are now a Certified Comprehensive Transition Program!